Our primary goal is crafting authentic franks that remind people how delicious a "dog gone good" can be: snappy, juicy, and bursting with flavor. Sure, we use only pasture-based livestock free from hormones, steroids, and other junk, and our dogs never contain nitrates or nitrites. But more than anything, we want eaters from 1 to 100 to say "wow" after tasting our dogs! These snappy dogs are loaded with flavor, not junk! Using premium cuts from cattle raised on pasture in California (naturally high in healthy Omega 3 fatty acids!) and organic spices, we've crafted a delicious dog that's lower in fat, calories and sodium than conventional franks. No nitrites, nitrates, hormones, or antibiotics, ever. Our brat dog is packed with rich porky flavor! 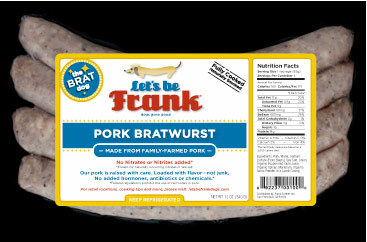 Made from pigs raised humanely using traditional practices and a time-honored blend of spices, these brats are free from nitrates, nitrates, hormones, and antiobiotics. Like our dogs, our brats are loaded with flavor, not junk! This fiery dog adds sizzle to any backyard barbecue! A zesty blend of garlic, herbs, and spices (and just a hint of smoky Spanish paprika) and our family-farmed, humanely raised pork combine to make one smokingly delicious dog. As always, no nitrates, nitrites, hormones, or antibiotics. 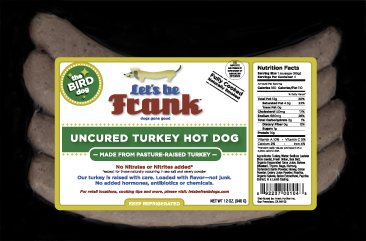 We spent years searching for turkeys that would make a dog worthy of Frank’s name! We finally found them happily gobbling grubs while roaming freely at the Diestel Family Ranch in the Sierra foothills. Plump, juicy, with a mild, well-rounded flavor, (and of course free from nitrites, nitrates, hormones or antibiotics) these dogs definitely aren’t for the birds! Let's be Frank uses grass-fed beef from local producers- REAL PEOPLE WHO RAISE THEIR BEEF IN WAY THAT DEMONSTRATES THEIR CARE FOR THE HEALTH OF THEIR CATTLE, THEIR LAND AND THEIR CUSTOMERS. Our local ranchers are stewards of the land first and foremost, because natural, high-quality pasture results in the best beef. 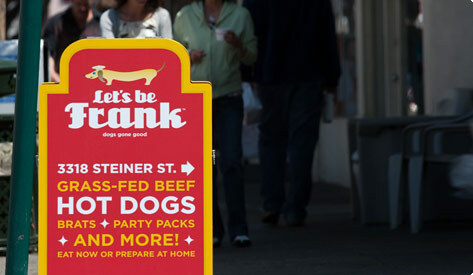 YOU CAN FIND LET'S BE FRANK DOGS IN NORTHERN AND SOUTHERN CALIFORNIA, AND SEASIDE, FLA.